I've been craving it since the holidays ended. Big bowls of fresh greens mixed with a light vinaigrette, or heaps of stir fried veggies over rice. My body needs greens. 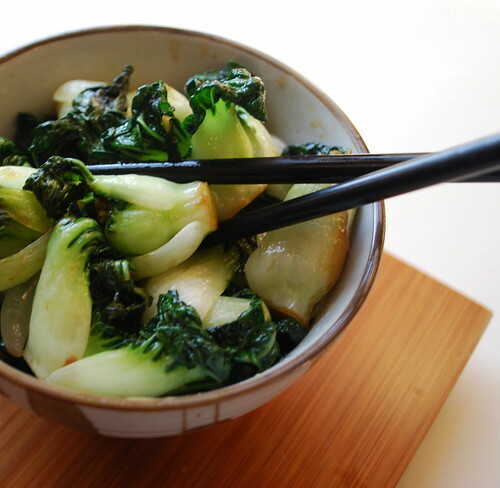 One of my favorite greens is bok choy. Baby bok choy to be exact. I buy mine at an Asian market. If you have a local Asian market in your town and haven't checked it out.....why not??? I love the two near me. Yes some of the items don't have an English labels, but I've found that the folks who own the stores are always more than willing to help me out and direct me to the item I'm looking for, or tell me just what it is I'm holding in my hand, lol. I visit so often now that they recognize me when I walk it. It's kinda nice. I go about once every 3 weeks to stock up on noodles, sauce, Chinese sausage for stir friend rice and fresh veggies. Lots and lots of fresh veggies. On my last visit I bought a big ole bunch of my fave. It's so easy to make. 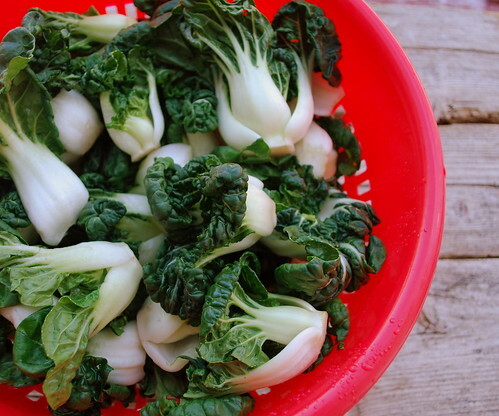 Just wash the bok choy really well and drain. Heat a large skillet with 2 tablespoons of canola oil. Add in 2 cloves of chopped garlic. Let it cook for 30 seconds or so and then throw in the bok choy, stir, slap the lid on and let it steam for about 4 - 5 minutes. I give it a splash of soy sauce just before serving and those babies are ready to eat. Oh one more note, please try and buy your soy at an Asian market. The difference from the soy you can pick up at the mega centers is very noticeable. I won't buy mine anyway else, and another added bonus, it's so cheap!! Your taste buds will thank you! Here's to a greener 2010! Looks delicious Lisa, my kinda meal, too! Baby Bok Choy is seriously my favorite food IN THE WHOLE WORLD. I could eat it sauteed with garlic and olive oil, for breakfast, lunch, and dinner. And you are right, regular bok choy just isn't the same. I am so happy to grow it in our gardens in the summer. This baby bok choy looks so awesome. I think the trick is the very quick steam at a high heat...like you did :) I have not tried that Chinese sausage, it sounds great! This is the sort of simple preparation I'm willing to use for greens. I'll go to the ends of the earth to make a cool dessert, but when I just need dinner, this is what I want. I will go Asian mart-hunting! 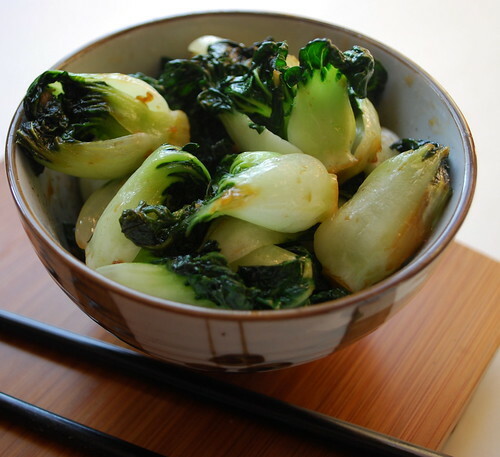 Thank you for this recipe for bok choy! During the summer, our CSA gives us armfuls of bok choy each week, and I am always at a loss of what to do with it. I think I'll stop by the store and pick some up today and try your recipe! Thanks for sharing! Those look fabulous! I've never seen baby bok choy before but I love to go to Asian markets. Sounds like its time for another visit. I'm going to try this! And definitely going to pick up the soy sauce and see the difference; as for price, I discovered long ago that even in the regular grocery store, I can get cinnamon in the Hispanic food aisle 3x cheaper than in the regular spice aisle! Gotta love the cabbage! I have a large head of bok choi in the fridge right now just waiting for some garlic and ginger. I love baby bok choy! That recipe is getting bookmarked! I have a funny story about bok choi. We love it and grow it in abundance. But I let the snow fall on the last crop. It was under a fleece out there, and I thought, well, maybe it would still be holding up. So I got out my garden claw and clawed through the snowbank...and clawed the beautiful little baby bok choi into green pulp. I wanted to cry right there on my knees in the garden. The great thing about Asian markets is also that you can get SO MUCH for so little. Most markets charge per bok choi; Asian markets charge per bunch. Gotta love it! And I agree wholeheartedly on the soy sauce too. YUM! I'd cut the bok chok in half or rip the stalks to make them easier to eat. annie, the baby choy was so small and tender there really wasn't a need to cut it or rip it to eat. Grapenut Pudding - made in the blender!